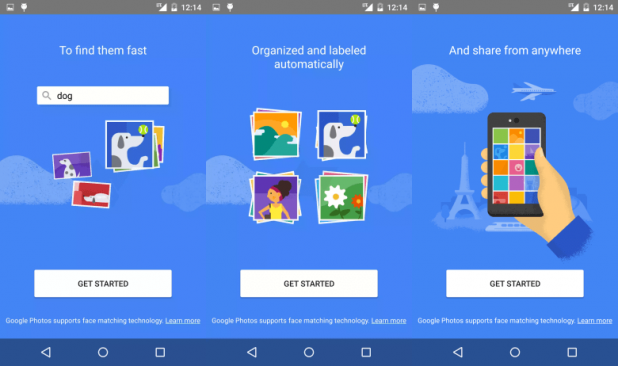 Google is launching an amazing photo app very soon. While using this photos app, users will be greeted with the awesome pinwheel animation similar shape what we see in Google Photos option. Splash screens aren't traditionally used on Android because they aren't strictly necessary, but Google has been having a lot of fun with icon motion lately, which may explain its presence. Next, of course, is the first-run experience. As with most Google apps these days, Photos explains itself up front in a series of friendly, animated illustrations. The user can then fiddle with some backup settings before being ushered to a few more illustrations. Google’s senior vice president for products, Sundar Pichai, was quoted by Venture Beat as saying the company would be looking at ways to improve user experience when it comes to photographs. Most of the app's functionality is given away in the above screens. This app will let users search for specific people, animals, or objects, back up photos automatically, and take care of general photo management. Addition to all of these this app gets a revised interface with several "views" to choose from. Users can see their photos sorted by day or month, or a "comfortable view" which tiles photos by day in a staggered grid sort of like Google+ photo albums on the web do now. Lets see how it appears once it is live.